Buy, Rent or Skip The Avengers? I have manage to avoid spoilers for this since the day it went into pre-production. I had every intention of seeing it in the theater, but that didn't happen. So, in the time I first heard about this and the ensuing months that flew by, I built this movie up way too high. Probably the highest ever. I knew that wasn't going to bode well for The Avengers. How can the movie possible meet those expectations? I was expecting a 10 Star movie with the amount of my own self-hyping. It will have to settle for 5 Stars. The movie is marketed as a 'stand-alone', meaning that the non-marvel fans do not have to see any of the previous movies such as Iron Man or Captain America to enjoy The Avengers. However, I do think that seeing Thor will give you a much deeper and richer movie going experience. I actually think it's vital that you do. The one film that you absolutely don't have to see to follow along with The Avengers is The Incredible Hulk. I think the studio would prefer that you don't since they are now on their 3rd actor playing the Green Monster on the Big Screen. Having said that, if you haven't already seen The Incredible Hulk, what are you waiting for? Go see it! It's awesome!!!! I think The Avengers is a new benchmark in coordinating an entire film franchise/universe through a series of individual films, culminating with everyone playing in the same sandbox. I was curious how each character would get their screentime and if it would come at the expense of someone else. Not the case here. Everyone gets their moment. I was actually surprised that Captain America is more or less running point. This isn't a knock against the character, but with Robert Downey Jr. the one with Top Billing, I'd expect the same for Tony Stark. With all the characters involved here, it is not at all surprising that the Hulk steals the movie from everyone and has the most awesome one-line retort after 'smashing' Loki and saying "Puny God". Come on, that was both awesome and hilarious. After this movie, I want more Hulk movies if they can deliver like this. As with all Marvel Comics movies, be sure to stick around after the initial end credits to reveal....THANOS!! Now I am PUMPED to see what they bring in the next Avengers movie. But be sure to stay to the very end of the credits to see the gang eating at the diner as a great callback to Tony's victory "speech". I highly recommend this as a Buy and I intend to get the 4 Disc Special Edition soon. I posted a full color image of the DVD cover and it comes out looking like that? What the hell! I think the Hulk is the only character you can get away with having a different actor each time because as long as he turns into the big green guy, we're good. I saw this in the theater with my mom and sister (any excuse for a family get-together) and they hadn't seen Thor or Captain America and I don't think they had too much of a problem with the set-up. They did all see (and love) Iron Man so I think that helps a great deal... and it also helped set up the realism of the universe, or rather the levels of realism we're prepared to accept, so that NOW we can accept the giant flying aircraft carrier with the spandexy outfits and so on. And is it just me or does it seem like we don't see THAT much of the interior of the carrier, I guess we do but somehow that lab... the way that shot that lab and with that window, every time the camera was in there it felt like the only room on the ship. Just that and the big bridge and a corridor. It really made me think of the last Star Trek movie and how there was one hallway and a shiny bridge (which you could barely see) and the transporter room and that was it, when I remember the movies before giving us hallways, engine rooms, medical rooms, they made that lovely dining room and blew the everloving crud out of it, it feels like we're getting less spaceship per movie. With the possible exception of Lockout. And can I say something about ScoJo? There's something about her as Black Widow I don't like. I think it's the hair, I think that hair is terrible on her, but to me the Black Widow was a Bond girl who decided she didn't need Bond anymore and tossed him off the side of a building, just drippingly dangerous. I was watching The Island not too long ago and the white body suit she wears in that immediately brought to mind the current white Fantastic Four outfits and it clicked, she could be a brill Sue Storm. Of course, I don't have an alternate in my head to cast Black Widow, and it's not like I can do anything about it, I just feel like I'm alone in this. Oh, and the scene where they go to Germany, did it actually feel to ANYONE that they were in Germany? Didn't to me. AND the one thing I would have LOVED, LOVED, gone nuts for and screamed in the theater if it happened, was that in the scene where those people are holed up in the bank, one of the hostages should have been Andrew Garfield, and he slowly lifts up one of his sleeves and almost reveals his web-shooter, but is interrupted by Captain America breaking in. Seriously, how epic would that have been? I don't have a problem with Scarlett Johansson as Black Widow. I actually liked her quite a bit in this one, which I wasn't expecting to at all. I thought for sure she would have been the "throw away" character. As for Andrew Garfield, that would have funny as hell and would been another way to expand the 'film universe' as one. I actually liked her more this time than in Iron Man 2. But it still feels like ScoJo (I don't want to keep looking up how to spell the name, sue me) playing a character more than the Black Widow brought to life. And it's more striking when you have a perfect Tony Stark and a perfect Thor and perfect Cap and so on. And I kept thinking of League of Extraordinary Gentlemen the whole time, especially given how much time they spent on the ship conducting experiments, the ship gets horribly damaged and the Hulk comes out, I kept thinking "I saw this before!" I'm probably going to watch The Avengers again in the next couple of days and see how I respond to the movie the 2nd time around. Nice to finally be able to watch this. I had to skip this and put it off the side until I saw the movie. Finally watched the review just now. Like I said, I avoid spoilers with a passion. Anyway, everything Jeff said is spot on and pretty much sums up how I felt about the movie. Even Alex said some things that I agreed with. No shock that IGN named this 'Movie Of The Year'. 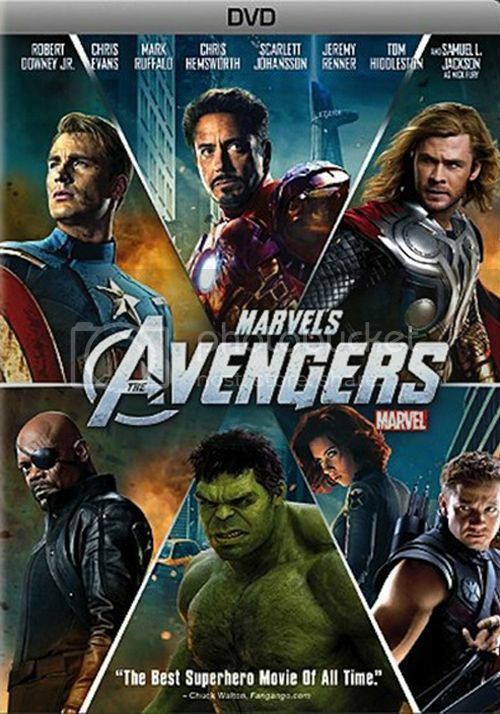 Considering my perspective on this genre of movie, The Avengers was enjoyable. Still like Iron Man the best to watch... And I was surprised me liking Thor. I liked everything about the movie, but for me what puts this over the top into something truly epic and fun to watch is The Hulk. Because of where he started with the TV series and then through the subsequent films, you get a sense of arrival in The Avengers. They finally got everything right. How were the other's wrong. Studios/directors perspective or reinterpretation? The TV series, even though I watched it religiously as a kid was nothing more than Lou Ferrigno in body paint. Doesn't scream belivable at all. The first film directed by Ang Lee was a joke and is in my Top 3 most hated movies of all time. HORRIBLE. The story, acting, direction and CGI was blow-your-brains-out bad. I did enjoy and like the followup with Ed Norton. It was fun, but the CGI, although better this time around....was still not perfected and needed work. With The Avengers, all the parts finally came together as it should have been all along. I've been wanting to do a mini Thor Marathon for quite some time and having watched Thor yesterday, that brings me to The Avengers. Now when I originally watched Thor and then Avengers on DVD, the time in between was huge. Even though it was a "loose sequel" to Thor, it never played like one. But with Thor fresh in my memory and watching Avengers today, it definitely played much better. Kind of an odd thing to say about this movie given the fact that I already rated it 5 Stars. But I actually liked watching this one even more the second time around. Seriously man, Hulk makes this movie what it is. I DEMAND that he get another shot at a stand alone movie. They finally got it right and the demand is out there to make it happen. A couple of things that I don't think I ever caught the first time around was the Point Break joke, which I thought was hilarious. One thing that I do remember was Nick Fury's Galaga joke. What I didn't catch was the button on the scene when the Agent goes back to playing said game on the monitor. I must have looked away for a split second because I don't remember that scene at all. Very funny. Still amazed that the studio was able to pull this movie off without a hitch given the amount of star wattage here. That's a lot of egos that want top billing. But they all played great together in the same sandbox. Hope Avengers II is more of the same times 100. Whenever I go to Best Buy, The Avengers is always playing on the biggest TV there, so every time I go there I think "I need to watch this movie again."